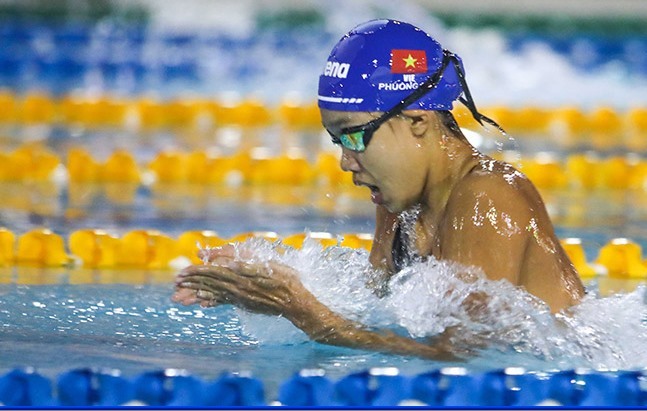 It is no doubt that “iron girl” Nguyễn Thị Ánh Viên is the best swimmer in Việt Nam. She won 16 titles at the national championship, eight gold at the recent Southeast Asian Games and two others from the Asian Indoor and Martial Arts Games. However, people witnessed firsthand the rise of a new star at the national tournament, which closed in HCM City on October 9. Vũ Thị Phương Anh, 16, was the only athlete to beat Viên in both individual and team events at the tournament. Anh competed against Viên in the women’s 50m breaststroke and finished first with a time of 32.26sec, shocking everyone at the tournament. Viên came second, at 33.19sec. Anh’s victory is considered as “magic” because the 16-year-old was not considered a worthy rival to Viên. She has trained as a professional swimmer for just over two years. “I just try to beat my own result. After finishing the race, I looked at the electric board and was surprised to see my name on top, above Viên’s,” said Anh, after claiming her first national championship title. “It is an unexpected win. My hard work helped me achieve the sweet result, but beating Viên once is not a big thing. However, it will help push me further in terms of training and competing,” she said. Anh also threatened Viên’s No 1 position in the 100m breaststroke, the day after. She made strong flaps in the last metres and nearly caught up with Viên at the finish line. However, Viên won with a flash gap and Anh came second. But Anh did a better job the next day, when she beat Viên for the second time in the women’s 4x200 freestyle team event after her HCM City squad finished in first place. Viên’s Military team came second. Anh also pocketed three other golds in the 4x100m medley, 4x100m and 4x200 in the freestyle mixed team events and set a national record. However, Đỗ Thị Hưng, Anh’s mother, said swimming was not always on the cards for Anh. “Anh used to be a girl with a poor physique. She would not eat right, and would get sick all the time. I thought swimming would be good to help her get better, and she started the sport at the age of 14. She fell in love with it and coach Chung Tấn Phong discovered her talent. He came to us and persuaded us to let Anh train professionally. But we said no,” she said. Her family’s concerns did not stop Anh from swimming. She kept talking to her parents for four months, and finally received their go-ahead. One year later, Anh took part in an Asian tournament to get experience. She qualified for the finals of the 200m breaststroke and 400m IM and ranked eighth. It took her another year to win the first international medal. Anh, who is also a bookworm, claimed a bronze from the 2016 Asian Youth Swimming Championships in the girls’ 50m and 100m breaststroke events, and two other bronzes at the Asian Age Groups Swimming Championship in the 50m and 200m butterfly. 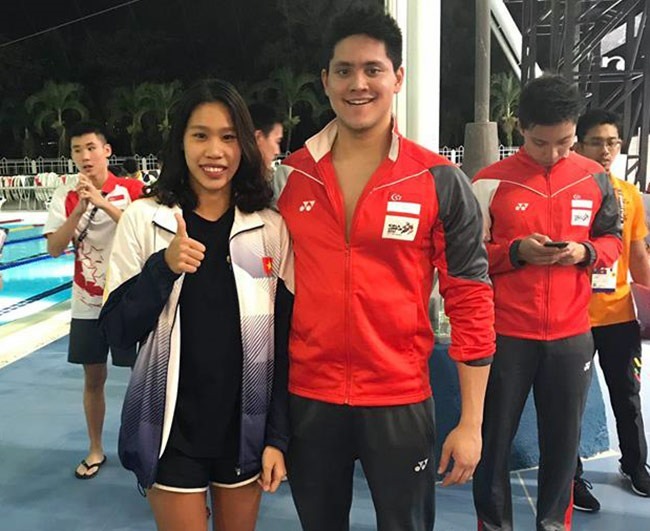 At the 29th Southeast Asian (SEA) Games in Malaysia in August, she competed against senior athletes and finished fourth in the 400m individual medley. “She is only 16 but has an ideal form for swimming with a long arm span and a height of 1.69m. She is progressing perfectly. But it took her only two years to achieve such a good result. It is remarkable. I hope to see another Viên in the future,” said Phong, who is HCM City’s head of the aquatic sport department. “Anh is good at all four kinds of swimming techniques, but she does best at the breaststroke events. She still needs to perfect her technique which will help improve her result in the upcoming events,” he said. Anh knows her journey ahead will have challenges but she is still hopeful.